RadBusyIndicator is a content control which gives you the ability to notify the user that there is an ongoing process in the application. The most important part of its visual representation is the ProgressBar and the busy content which purpose is to further inform the user about the current state of the ongoing process. 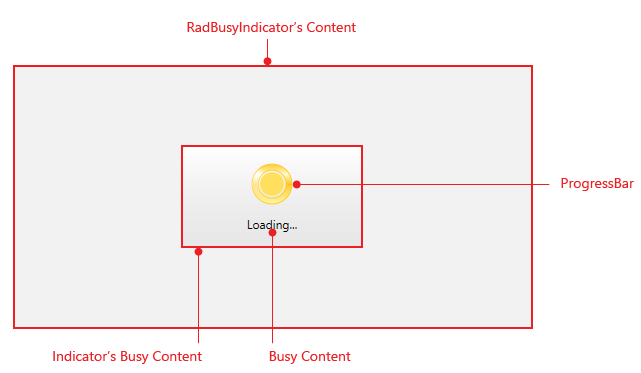 RadBusyIndicator's Content - is the controls content. Indicator's Busy Content - hosts RadBusyIndicator's busy content visible while it is active. Busy Content - is the ContentPresenter giving the user additional feedback of the current progress. ProgressBar - is the RadProgressBar control representing the ongoing process.